The Gist: Recognizing one's threshold to change practice exists as important part of both one's education as a trainee as well as one's longitudinal practice as a health care provider but is often neglected in medical education . Beware of changing practice based on a single study/role model/source of information. Increased emphasis and comfort in having one's practice challenged and unlearning ideas/behaviors is important and these habits should be established early through encouragement from training programs, self-reflection, and judicious use of Free Open Access Medical education (FOAM) - as detailed here. Medicine exists as a persistently changing field with a historically slow uptake and, especially in EM, there is significant practice pattern variation - between individuals, groups, and regions. Although the majority of medical education focuses on learning the basics, learning how and when to change one's practice is an aspect that feels unnatural and is probably easier cultivated in the beginning. Below is a variation on the curve that is typically associated with the adoption of technology but may also reflect thresholds for change in medical practice, along with characteristics associated with each group. The adoption of medical practice based on these group reflects varied thresholds for practice change. The Case: A trainee read a blogpost on use of metered-dose inhalers (MDIs) versus nebulizers in asthma. The trainee quoted "hearing" of the equal efficacy of both to an attending and was met with resistance. As a result, a dive into the primary literature resulted in a blog on the subject. Although the practice of MDI with a spacer is supported by texts such as Tintinalli's and several Cochrane reviews, the trainee often meets resistance from attendings using MDI+spacer in the mild to moderate population. Some attendings encourage this practice while others renounce it, stating that the patients expect the nebulizers as part of the expectation of coming to the ED, conclude MDIs take too long, or are unaware of the recommendations for MDIs despite evidence to the contrary. What should the trainee do in this mix of opinion? Go along with the flow? Spark conversations that may rub some senior clinicians the wrong way? This is a common phenomenon both in medicine and even in this particular example, as evidenced by the call for knowledge translation on this subject by Osmond et al, who identified common barriers to adoption of this treatment modality for asthma in the ED . When and how do we change our practice, especially as one is simultaneously laying the foundation to one's practice? Interpreting primary literature is important and changing practice based on a study gets a cursory nod in Rosen's . 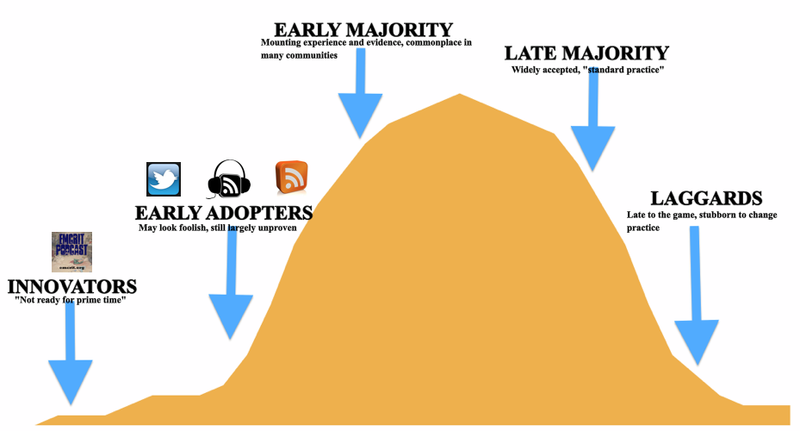 A future post will delve into this; however, for junior trainees, identifying one's threshold for practice change (where on the curve does one fall/wish to fall) and noting contributors to practice patterns (peer influence, podcasts/blogs, emulation) exists as tangible aspect in the knowledge translation spectrum. 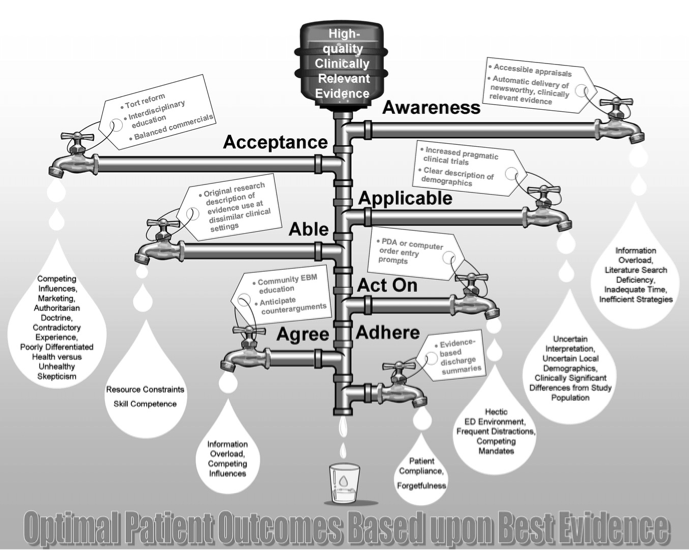 An excellent article by Diner et al details specific ways in which residencies can assist trainees with this process, exemplified by this visual representation. Empower residents to order/engage in different interventions or practices. Experienced clinicians can act as safety and feasibility stops, but giving residents the support, encouragement, access to interventions (or omission of), and ability to think on their own or apply evidence is valuable. Recognize individual thresholds to changing practice and communicate these thresholds with residents . Expert clinicians have practices rooted in habit and experiential outcomes in addition to data, contesting these practices may be difficult, particularly for junior trainees. Structuring discussions with faculty using examples of practitioners' thresholds for practice change could be valuable. Use journal club to discuss items beyond methodological rigor, but also as practice identifying what might be needed to change practice - within one's own settings or others: Research? Health care structure? Funds? Education? Ask, "Why?" This may not always be the most appropriate way to frame the question (change the semantics to suit the situation), but inquire from supervising physicians about what makes them employ diagnostic or therapeutic modalities. It's a way of engaging in balanced, non-aggressive dialogue about things one might do differently and offers a way to introduce and think about integrating a new practice or literature at the bedside (for either trainee or attending). Seek information that challenges one's own beliefs. The alternative information may not always be accurate, but one does a disservice to oneself by neglecting the opposing viewpoint and selectively looking at information that supports our own biases. This is part of what creates the "laggards" in the above graph. Recognize hero idolatry. We inevitably develop heroes and role models but despite deep respect and eagerness to please, it's important to maintain a skeptical eye towards what they preach and practice because they, too, are human. For example, one can use innovative podcasters as a barometer for change, but read and think carefully about these ideas/interventions before adopting them or blindly quoting them. The latter can also make a conversation about practice changing go awry - so use the best available evidence as a guide. Develop a system for keeping up with new thoughts in medical practice - a method that allows one to filter the signal from the noise. Information overload and the onerous task of attempting to "keep up" with evolving literature and ideas exist as a barrier to knowledge translation . Free, creative ways of achieving this include interacting with the FOAM community through Twitter and the host of blogs and podcasts dedicated to EM/Critical care literature such as The Skeptics Guide to Emergency Medicine, EMNerd, EM Literature of Note, and the Life in the Fast Lane's R&R. Follow innovators in the field such as Dr. Scott Weingart's EMCrit podcast. Understand aspects of practice influenced by external factors such as industry (pharmaceutical companies), administrators (how does the intervention affect the system? ), personal incentives (RVUs), and mandates from supervisory agencies (ex: blood cultures in pneumonia). For example, use of a nebulizer in an ED visit can increase the level charge for the visit making it an easy way to increase reimbursement for the visit. Recognize one's own biases. This requires introspection. For example, we often practice in a reactionary fashion - if we see an intervention "work" at the bedside, we may be more prone to neglect evidence to the contrary or safety data based on our experience. This is more likely to gather momentum as the breadth of our experience increases throughout training and practice. Understand the limitations of groupthink. Most graduates of EM residency programs practice in the community setting and, in addition to resource barriers, there may be less flux or diversity of thought without monthly journal clubs and group debates. Practitioners generally practice what they learn during training, which offers a single institution's perspective. Recognizing this as a limitation and seeking and expanded, diverse viewpoints is important. 1. Diner BM, Carpenter CR, O’Connell T, et al. Graduate medical education and knowledge translation: role models, information pipelines, and practice change thresholds. Acad.Emerg.Med.2007;14(11):1008–14. 2. Osmond MH, Gazarian M, Henry RL, Clifford TJ, Tetzlaff J. Barriers to metered-dose inhaler/spacer use in Canadian pediatric emergency departments: a national survey. Acad.Emerg.Med.2007;14(11):1106–13. 3. Young KD, Lewis RJ. "Medical Literature and Evidence-Based Medicine." Rosen's Emergency Medicine. 7th ed. p2517. Keep healthy life by consuming healthy food and doing exercise regularly is the best healthy formula.